I was originally going to be very, very positive about Assassin’s Creed 2. I skipped the first game after hearing horror stories about how unrefined it was, but AC 2 is the real deal; a free-running game set in fifteenth century Italy with a heavy emphasis on open world gameplay and lots and lots of stabbing1. To begin with I was wowed by the sumptuous environments (more on that later) and the seeming ease of movement allowed by the free-running system. 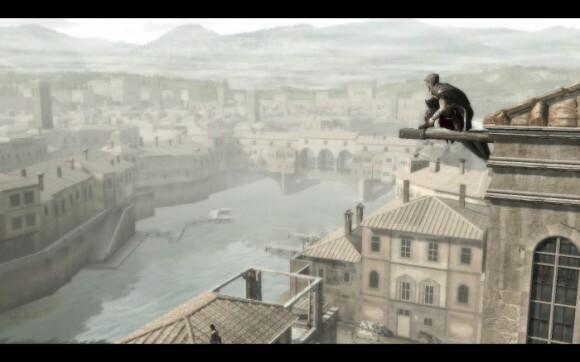 But AC 2 is one of those rare beasts; it’s a game that’s actually far too long for what it is. It’s not like they’ve stooped to the depths of Far Cry 2 in terms of recycling content – there’s four very meaty maps to explore plus a personal hideout town – yet if you stare at even the finest artwork for long enough you’ll start to notice the cracks in the paint. So it is with Assassin’s Creed 2.